Dalibor’s background is mainly in business leadership. Started his career in FMCG finance, moved to insurance/banking as head of distribution for ING/NN and later to Allianz as head of products & marketing. During last 5 years his focus is preliminary digitization of the finance sector where in Moneta he drives the digitization of the channels as well as online distribution of Moneta’s products. 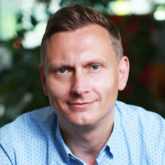 Dalibor will talk about how the business person can become responsible of e2e IT delivery while at the same time drifting the organization towards agile. How difficult is to interpret agile into real value in strongly waterfall organization and when is the best time to do so. One of the engines of Moneta’s ambition of becoming digital leader in banking. Building digital channels in agile way of working and most recently helping to drive the agile transformation through out the entire organization. From strongly waterfall set up and controlled environment to naturally empowered organization in 2 years.